In my experience, metal of the doom variety has more often than not boasted thunderous walls of guitar and drum rhythms that are so excruciatingly drawn out and slowed down over the course of an album that "serene" is the last descriptor that would immediately come to mind. Cue in SubRosa, a band that I happened to stumble across three years ago with the release of their last album, More Constant Than the Gods. Through harnessing the harmonious vocals of Rebecca Vernon along with layered violin work, I was blown away by how they incorporated these elements with the aforementioned doom metal tendencies. The result is a sound that can be as morose as it is blissfully uplifting. Despite the heavier aspects of SubRosa's sound taking the heft of the experimentation on For This We Fought the Battle of Ages, the spirit of this placid sound is still very much carried on in in their latest effort. "Despair is a Siren" and "Wound of the Warden" front load the album with some of the heaviest material to come out of the SubRosa camp ever. "Despair" builds tension with deep droning guitar notes that violin staccatos accompany; ultimately leading into the instrumental chorus of the track whose melody is guided by the violins but are backed by loud guitar distortion. Another interesting note is how Vernon's vocals slowly become more distressed/raspier as the track progresses into it's more triumphant peaks. "Wound of the Warden", however, presents a much fuller version of the base that "Despair" laid out. The melodies ring truer, the rhythms are grungier and louder, and, as an unexpected treat, we get some harsh vocals thrown in the mix to further emphasize the heavier nature of the album's opening 28 minutes. From there on, the rest of the album begins to transition into the more varied and anodynic core of the band's sound that fans of the previous album would be more familiar with. As the instrumentals slow down to accent the melancholic laments of the vocals, "Killing Rapture" and "Troubled Cells" are simply sublime tracks and excellent ways to wrap up the album. I've mentioned a few times so far how violins are very much a part of SubRosa's sound, but I feel as though I've undersold that a tad. The violin work of Sarah Pendleton and Kim Pack is the lifeblood of the band. 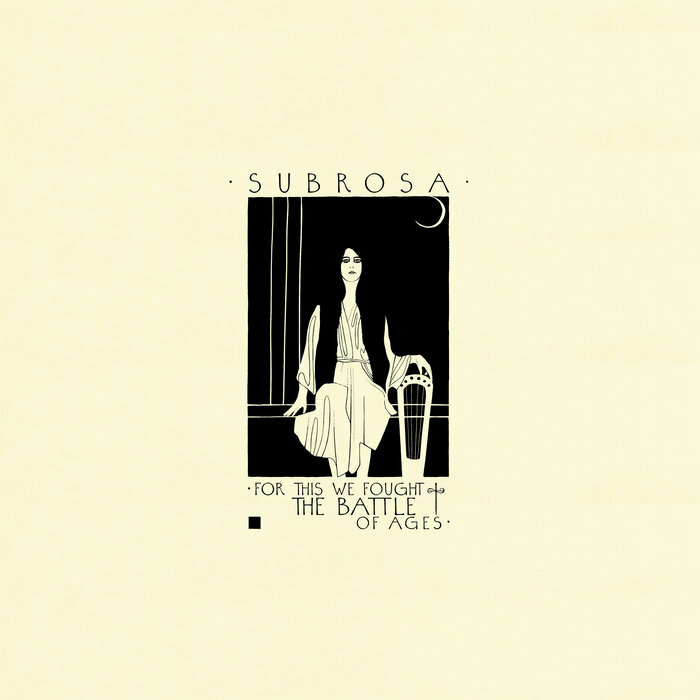 Any atmosphere that is created on a SubRosa album is primarily driven by violins, which is not only unique but is also staggering when you realize the level to which they are performed. On both For This We Fought the Battle of Ages and More Constant Than the Gods, they've taken these skills to new heights. Whether they are forming vociferous melodies with the rest of the band's instrumentation or are emphasizing the sometimes heavenly nature of the vocals, it's this diversification of speed and style that make these compositions compelling. With For This We Fought the Battle of Ages, SubRosa has added on to an already substantial list of great albums to come out in 2016. Through its peaks and valleys, the album balances the loud distorted nature of doom with hauntingly beautiful melodies that ultimately transforms the album from just any other listening experience into a journey. However, given that the majority of the album's tracks are 10 minutes or longer, this is not an album (or band for that matter) that is best enjoyed piecemeal. But if you're willing to set aside the time, you won't be disappointed in what For This We Fought the Battle of Ages can deliver.